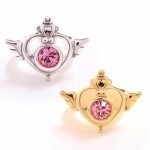 Good news for exceptionally wealthy Sailor Moon fans who like to flaunt their money! 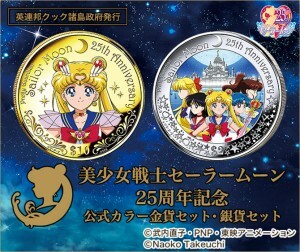 A couple of official Sailor Moon coins are being minted to celebrate the 25th anniversary. There will be a gold and silver coin and despite their coming in $10 and $2 denominations they are significantly more expensive. The gold $10 coin costs 39,800 yen, about $375 US while the silver $2 coin is a mere 19,800 yen or $187 US. Yes it would appear, based on the amount listed on the coin, that the more expensive gold coin is the better value! In truth, the economics of these Cook Island coins are a bit more complicated as I’ll explain shortly. The gold coin features Super Sailor Moon from Sailor Moon SuperS on one side with the face of Queen Elizabeth II on the other. 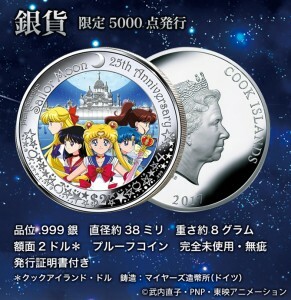 The silver coin has Sailor Moon from Sailor Moon S with her Spiral Heart Moon Rod as well as Sailor Mercury, Mars, Jupiter and Venus with the Moon Palace in the background on one side and again the face of Queen Elizabeth II on the other. Both are dated 2017 which is not actually the year these coins are being sold in. They come in nice collectible boxes. 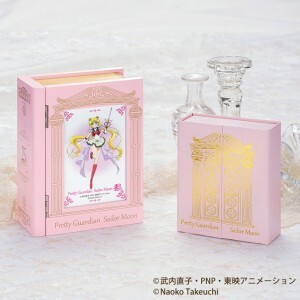 The gold coin box features Super Sailor Moon with her Kaleidomoon Scope and the silver coin box shows the Space-Time Door. Queen Elizabeth II is featured on these coins, as she is featured on many pieces of currency around the world including those here in Canada because the Cook Islands has a free association with New Zealand and New Zealand, though they have a Prime Minister, still has Queen Elizabeth II as their head of state. Since Sailor Moon is technically royalty and the future Queen of Crystal Tokyo there really are two monarchs on these coins which seems like a bit of a conflict. What are the Cook Islands? Good question! I’d never heard of these before hearing about these coins. This series of small islands in the Pacific get their name from Captain James Cook and have a reputation for helping investors shelter their money, though not through investing in expensive Sailor Moon collectible coins. Since Cook Island’s Government allows private groups to mint commemorative coins for a fee they regularly produce this sort of collectible coin. Taking a quick look at the Japanese Mint’s list of collectible coins released to date we can see that unlike other countries they aren’t in the market of making anime and other pop culture based coins, which is likely why these are being made in the Cook Islands. What will the $10 and $2 coins actually be worth in Cook Island dollars then? The Cook Island dollar has a fixed exchange rate with the New Zealand dollar. The $10 gold piece has a value of about $7.30 US while the $2 silver coin is worth about $1.45 US … or at least they would be except for the fact that commemorative coins from Cook Island are not recognized as legal tender on the Cook Islands. 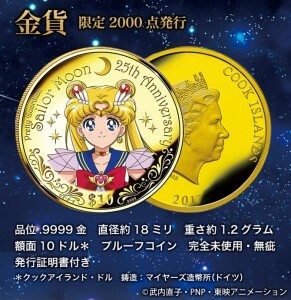 That’s probably for the best since it would take you over 50 Sailor Moon gold coins to buy one Sailor Moon gold coin when exchange rates are considered. As a Canadian I’m familiar with a number of collectible coins based on popular franchises being sold here for a fraction of this price with such coins often selling for $50 to $150 which seems cheap in comparison to these! Though only some of these are minted in Canada I was surprised, while looking into these, that some of them are produced by the New Zealand mint for places such as Nieu, near the Cook Islands. Since Canadian coins also feature Queen Elizabeth II such things are not always evident when examining a coin at face value. There is clearly a complex world of collectible coin politics I’ve only just scratched the surface of! Are you a rich person who heats their home with the burning pages of Sailor Moon Volume Infinity art books who plans on getting these? 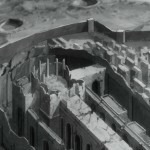 Could we see the remains of Silver Millennium with a telescope from Earth? This entry was posted in Merchandise and tagged Collectible Coins, Cook Islands, Kaleidomoon Scope, Pretty Guardian Sailor Moon 25th Anniversary, Sailor Jupiter, Sailor Mars, Sailor Mercury, Sailor Moon, Sailor Venus, Silver Millennium, Space-Time Door, Super Sailor Moon by Adam. Bookmark the permalink. They look nice, but I think I’ll spend my money on tickets to Book of Mormon instead. There’s a movie on that? I assumed the “Book of Mormon” Rami referred to is the stage musical comedy with the same title. Ah, looks like Toei is still in search of funds for Crystal -_- . I would seek financial advice from Gurio Umino. Or from Umino’s rival, Masato Sanjouin. I’m pretty sure he can make a donation. I would to seek both at the same time. I need more friends in my life. 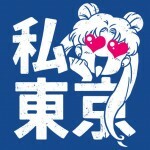 No one on YouTube answered my reply about me hoping Rei didn’t growl at Usagi for not getting a Juban uniform. I bet Rei’s father would know how to make money. I agree and would consider donate. Yeah, like a kick starter for a real budget! I’d pay some money for that! I like making people grin and laugh so, the pleasure is all mine . This June, I hope we get released dates for Sailor Moon Crystal Season 4. Also, on Behind the Voice Actors.com, Sailor Moon Crystal isn’t over. Remind me in June. We have such a random fandom. I hate that, when items release with only a limited time to buy them. They don’t realize some people make very little money, so it takes awhile to save up. 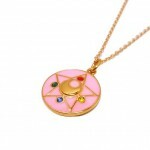 That’s how I lost the Chibimoon coin cause I couldn’t save up enough money in time. Well, this Crystal Night on March 16 wont b related to Crystal at all, so our hope is the Anime Matsuri, Texas, Hope people there won’t let Chiaki Kon to leave without revealif something. That’s so disappointing. What is Toei’s deal? Don’t they like hype? I know they like money! 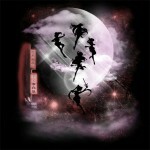 Been wondering, does anyone ever think Sailor Moon will ever get an Ultra 4K HD release? I doubt, considering anime is produed on 720p in general, the 1080p is usually upscale. Surely I’m not the only extremely bothered by the fact she has the wrong tiara in the coin’s artwork? Now that you’ve pointed it out I am too!